Organic Kids Pre School in Patliputra Colony, Patna has developed the unmatched teaching and learning methodology for kids which can develop their minds and make them learn by means of play. Our learning programs have been designed in such a way that every child feels no pressure and takes interest in understanding things by playing, making art, doing activities, watching audio visual contents etc. 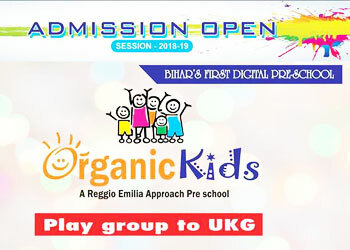 Organic kids Pre school is centrally located in Patliputra Colony, Patna which is easily reachable from all locations of Patna like Boring Road, Buddha Colony, Rajiv Nagar, Kurji, Digha, Boring canal road, Nehru Nagar, Anand Puri, Sri Krishna Puri, Fraser road, Exhibition Road etc. We have designed a learning tablet for kids of playgroup to make sure that child gets all round skills exposure and development. It also aims at inculcating reading, musical, mathematical, logical, technology skills and analytical ability. We provide IT enabled and technology based learning system for kids of class Pre Nursery, Pre Primary, LKG, UKG, Kindergartens, daycare etc. We are the best kids play school in Patna, Bihar. Co-founded by ILA Bhardwaj and Anjani Kr Bhardwaj, who themselves are leaders in education industry and have vast experience in running chain of educational organizations internationally, makes sure that your child gets the desired skills and exposure from the day one. Teachers treat every child as their own son or daughter and take care of all activities. Whether it’s a matter of learning, health, excursions, exposure to the outer world, exposure of science and technologies, our mentors have proved to be the best in Patna, Bihar. Our curriculum includes activities for kids of Nursery and playgroups like Sand art, Creative art, Learning by doing hours, Puppet shows and skits, Free Play, Library time, Creative time, Sensory time, DEAR class, Celebration of festivals and special days etc. Parents are an essential component of the program - a competent and active part of their children learning experience. They are not considered consumers but co-responsible partners. Their right to participation is expected and supported. Every feedback is important to us for our methodology improvement. If you are looking for overall growth of your child then visit Organic Kids Pre School in New Patliputra Colony, Patna which has been rated best Play School / Kids School / Pre Nursery School / Kindergarten School / Pre Primary School by parents of students studying in our school. Please call us at 9801910819 / 8084114715 for more details. Please see our video on this web page which is glimpse of our Pre School.